A popular saying is that people come into your life for a reason, a season or a lifetime. By any number of statements from members of Pensacola's Temple Beth El, Rabbi David Ostrich has touched their lives for a lifetime. Despite his departure to assume the pulpit at Brit Shalom in State College, Pa., he will leave behind an esteemed legacy. Starting Aug. 1, Rabbi Leonard Zukrow will succeed Ostrich in Pensacola. 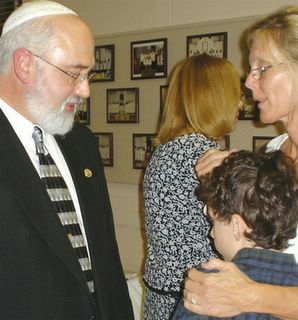 Florida's oldest congregation honored and bade farewell to their rabbi of 15 years on June 24. Not only Beth El congregants, but numerous members of Pensacola's broader community, filled the historic sanctuary. Ostrich's many accomplishments and contributions during the past 15 years have been well recognized in articles, farewell gatherings and honorary celebrations. In a recent editorial in the Pensacola News Journal, Opinion Editor Carl Wernicke wrote: "I count Rabbi David Ostrich as one I have been honored to meet along the way. His move to Pennsylvania will leave this community just a little less vibrant than it was." Beverly Patterson, spokesperson for Suter Elementary School, said: "Our PTA is sponsoring the Rabbi Ostrich Community Spirit Award, which will be presented, along with $100, to a deserving fifth-grade student every year to be used in a community service project. We just wanted to choose an appropriate tribute to celebrate Rabbi Ostrich's contributions to the schools and community. We felt that he would like knowing that an enthusiastic interest in taking personal action was stirred within our students and will continue in his name." Ostrich was raised in a small Jewish community in Lafayette, La. - so small, in fact, that the congregation had no rabbi until Ostrich was 12 years old. Ostrich credits that rabbi, straight from Germany, for awakening a deep connection to the antiquity of Jewish tradition. From that point, Ostrich pursued and gained an impressive Jewish education, which included Hebrew Union College-Jewish Institute of Religion in Cincinnati, Ohio. Before coming to Beth El in 1990, Ostrich held the pulpit at Temple Mickve Israel in Savannah, Ga.
Hardly a cloistered academic cleric, Ostrich served on the Mayor's Task Force on Abortion-Related Violence and Community Values, as chairman of Escambia/Pensacola Human Relations Commission, as president of the Pensacola Ministerial Association and was an active member in the Rotary Club. Ostrich's courses on Judaism and Business Ethics at the University of West Florida and at Pensacola Junior College were favorites among students. Appearing on public-access shows, "The Moral Side of the News" and "Religion for the Public Square," a large audience was favorably affected by his perceptive insight and quick wit. He was a much sought-after speaker for area schools, churches and colleges. At the conclusion of Ostrich's farewell service, he patiently stood by the exit door, and spoke with each person who filed out. From the long-winding line of well-wishers, accolades were bestowed, punctuated with heartfelt sentiments of loss, and fond and cheerful reminiscences were shared. The women of the Beth El Sisterhood had assembled an elegant display of home-made desserts for the expected large oneg crowd following the service. The spread included a hand-braided Challah, baked especially for Rabbi Ostrich, by F. Scott Moody. here has felt your profound sense of God and community." With that, Beth El Vice President Joseph Schlesinger unveiled a framed painting by artist Bruce David, entitled "Reflections of the Soul." Lewis described several features in the vivid pictorial representation which related directly to the congregation's affection for Rabbi Ostrich. "The artist designed this composition to illuminate the essence of many of Judaism's foremost qualities. The hands, Rabbi, remind us of you reciting the priestly blessing, May the Lord bless you and keep you, and give you peace." Lewis referenced the Torah, depicted in the painting as The Tree of Life: "You, yourself, have followed the Torah. You have taught us to follow by your example of performing good deeds." Pointing to the artist's interpretation of the Eternal Flame, Lewis quoted from Proverbs: "The spirit of man is the lamp of the Lord." "Your spirit, Rabbi, has illuminated ours lives for the better. We thank you and wish you and your family every blessing for the future," Lewis said. The fostering of Jewish enlightenment was not exclusive to Pensacola's human population. The canine population benefited as well. Ann Bollens, president of Emerald Coast Greyhound Rescue, recalled the organization's long relationship with the Ostrich family. "The Ostriches shared the love that filled their home by adopting and fostering retired Greyhound racing dogs until the dogs could be placed in permanent homes. The Ostrich family opened my eyes to what living a Jewish life is all about. In this case, the Jewish tradition of being kind to all creatures." Wendi Ochs, Beth El Religious School supervisor, said Rabbi Ostrich helped create the opportunity for the congregation to participate in the new religious school curriculum project by the Jackson-based Institute for Southern Jewish Life. "We would not have had the opportunity to participate... had it not been for Rabbi Ostrich. Northwest Florida was not included in the limited regions designated eligible for participation. Nonetheless, ISJL President Macy Hart waived that obstacle - because of his personal knowledge from Ostrich's work at the Henry S. Jacobs Camp. Linda Armacost, a Beth El board member, said "Rabbi Ostrich's influence has made Judaism the center of my life." Beth El Bulletin Editor Pat Langnau said, "I am very sad that we were unable to keep Rabbi Ostrich here; he is the reason I have a religion today." In Rabbi Ostrich's report to the annual congregational meeting, he stated that the small congregation at Brit Shalom is much like that of Beth El. It offers exciting possibilities and some interesting challenges, he noted. He closed with an invitation - "If any of you are ever in Central Pennsylvania, please stop in for services. It'll be a different address, but the same God and the same Judaism."